Sensible, interrelated sentences were presented with or without bizarre sentences that could be transformed to fit the context of the sensible sentences. Two experiments examined subjects' ability to recognize or recall both types of sentences, either immediately or after 2 weeks. 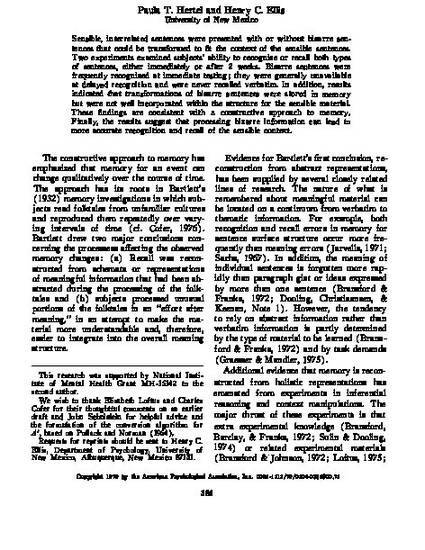 Bizarre sentences were frequently recognized at immediate testing; they were generally unavailable at delayed recognition and were never recalled verbatim. In addition, results indicated that transformations of bizarre sentences were stored in memory but were not well incorporated within the structure for the sensible material. These findings are consistent with a constructive approach to memory. Finally, the results suggest that processing bizarre information can lead to more accurate recognition and recall of the sensible context. Hertel, P. T., & Ellis, H. C. (1979). Constructive memory for bizarre and sensible sentences. Journal of Experimental Psychology: Human Learning and Memory, 5(4), 386-394.